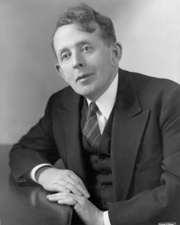 DONNELL, Forrest C., a Senator from Missouri; born in Quitman, Nodaway County, Mo., August 20, 1884; attended the public schools; graduated from the University of Missouri at Columbia in 1904 and from its law school in 1907; admitted to the bar in 1907 and commenced practice in St. Louis, Mo. ; city attorney of Webster Groves, Mo. ; Governor of Missouri 1941-1945; elected as a Republican to the United States Senate and served from January 3, 1945, to January 3, 1951; was an unsuccessful candidate for reelection in 1950; resumed the practice of law in St. Louis, Mo., where he died March 3, 1980; interment in Bellefontaine Cemetery. Sherman, Matthew C. The Most Serious Senator: A Reconsideration of Forrest C. Donnell of Missouri and the North Atlantic Treaty. Missouri Historical Review 101 (January 2007): 78-98.